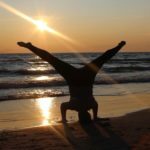 Getting into storytime yoga was a fairly easy transition for me, as I wanted to be able to teach classes that I was also able to bring my toddler to. I am very lucky to teach yoga in a massage therapy clinic whose owner is very supportive of offering activities for kids and families as well. She had been doing some research and mentioned to me that she had found some books that could be used to teach yoga as more of a story time for younger kids. I was intrigued, so I had her email me the link she had found to “Kids Yoga Stories” by Giselle Shardlow. Giselle Shardlow offers many different yoga stories. They are very easy to create a class around, because each page has a highlighted word and a photo of the pose that represents the highlighted word. Each book also has a glossary of the poses you will be doing during the stories, so you can choose whether or not you want to go over the poses before getting into the story, or if you want to teach and do the poses as you go along. 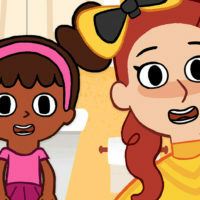 It is important to read the same story for at least one month so that the kids have time to familiarize themselves with the story as well as the poses that go along with the story. Depending on the time slot you have for class, you can read either one or two stories per class. In our studio we have a 45-minute class, which allows us to read two stories plus have a quick read-through at the end to see who remembers what pose goes with each highlighted word. In this class, it is so important to encourage kids to use their imagination and also to praise them for a job well done. It makes such a difference when you tell them that they did a great job at a certain pose, because at this age children are very shy, and they are nervous about people watching them do things. If you encourage them and tell them what a great job they’re doing, you can literally watch them come out of their shells. 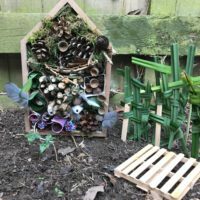 I bring my 2-year-old son with me to each of these classes and he loves the time he gets to spend using his imagination. One of the stories we read is about a farm, and part of it talks about going on a hayride. We have a lot of yoga bolsters and props in our studio, so we have each child use a rectangular bolster and pretend to be bumping up and down on a hayride. I also don’t follow each story word for word because I try to get as much imagination and fun as I can into the 45 minutes. Instead of reading the book as it is; for example walking to the pig barn from the cow barn, I tell the kids to get back on their hay ride and bump up and down to the cow barn. They get so excited to jump back on their bolsters and ride to the cow barn! I also add in little gestures that are mentioned in the books, like pretending to “throw” something in the garbage, or waving “hello” to people mentioned in the book. These little gestures keep the children engaged in the story rather than just having one pose for the whole page of the book. Another thing I try to do is to ask the kids questions about what we’re reading. For example, in the farm book I will ask the kids what noise each animal makes, and how they move. The kids love to be asked if they can run fast like a horse, or hop up and down like a frog. 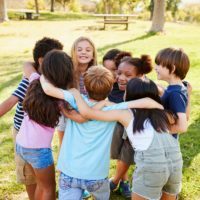 Doing these small activities also helps the kids to engage with each other, like chasing after each other or seeing who can jump highest. 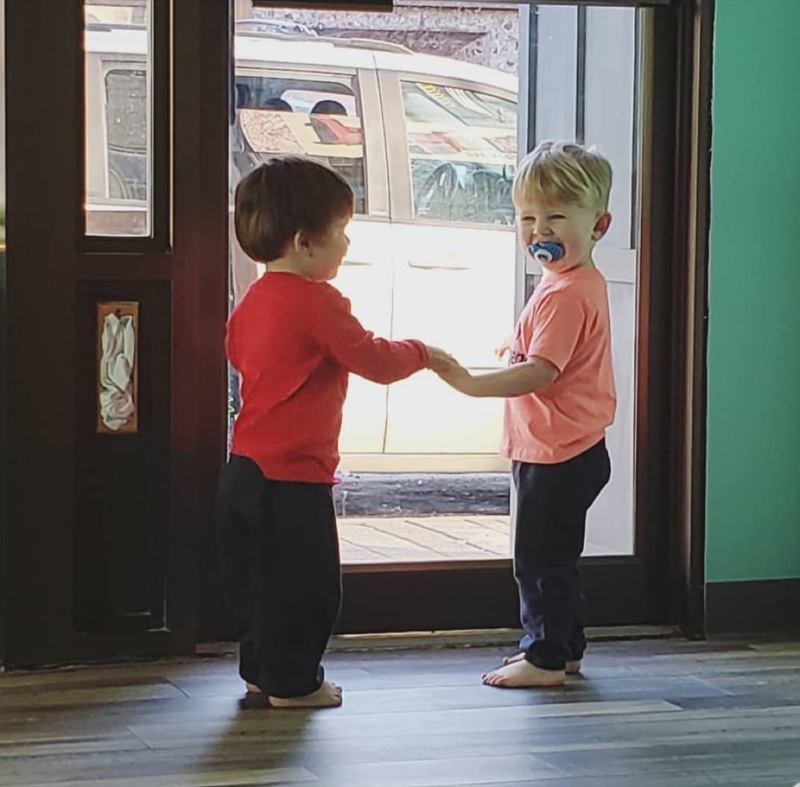 My son has made lots of friends in this class and he is rarely ever shy anymore. I highly recommend looking into whether or not story time yoga would be well received in your studio, or you can even try it at home or in your classroom! It’s hard to find activities for toddlers that keep them physically and mentally engaged, so I feel that this is a large reason why storytime yoga has been so well received in our studio. 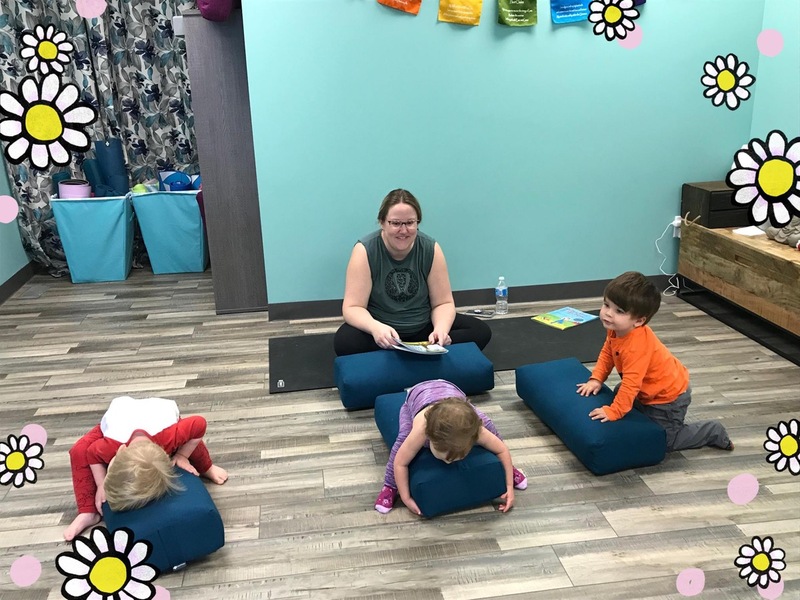 I hope you enjoy trying out story time yoga; and I know that seeing the smiles on the children’s faces keeps you searching for new ways to spruce up your classes. You can start your own journey into story time yoga at www.kidsyogastories.com.